Chaos. Vibrancy. Overstimulation. I’d missed that potent Mumbai blend. I wanted to be thrown right back into it. So on our way home tonight I asked our driver if we could stop at Muhammed Ali Road. Most people only see it from above the flyover (or raised highway) on the way from South Bombay heading toward Mahalaxmi. 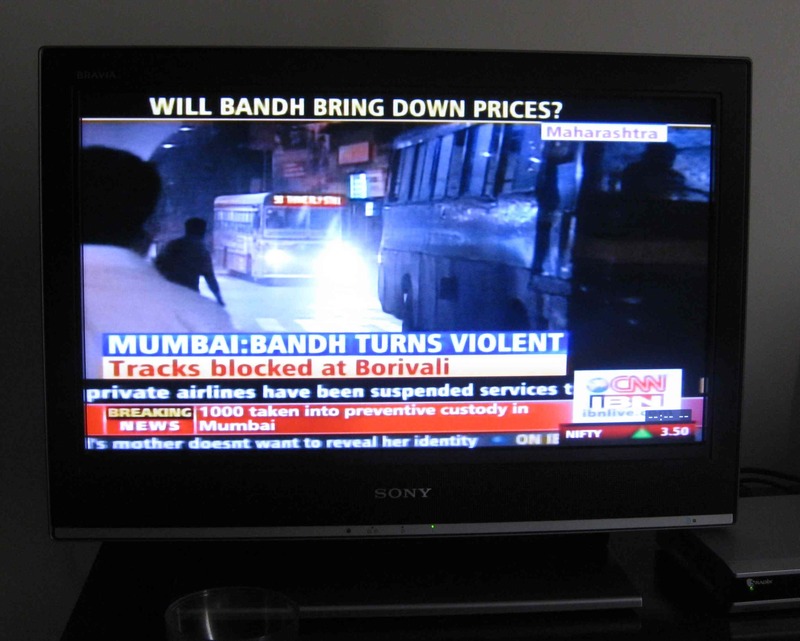 It’s one of the Muslim areas of Mumbai and normally not particularly notable. But at night during Ramazan (the way Indian Muslims pronounce what we know as Ramadan) it comes alive. Because Muslims fast all day during Ramazan, at night it’s time to celebrate. 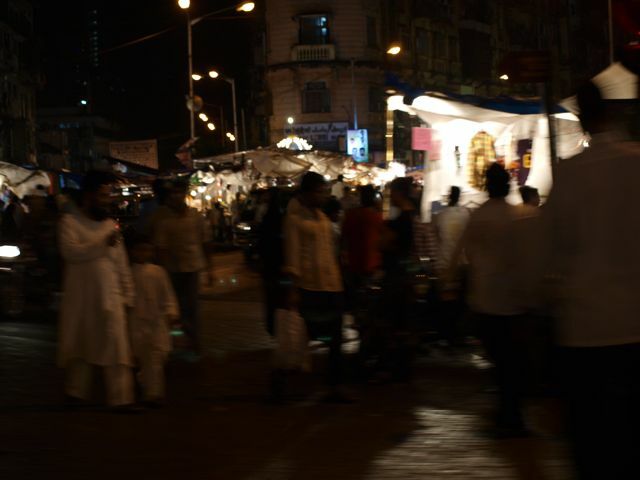 And Muhammed Ali Road is the center of Bombay’s Ramazan action. And tonight was the last night before Eid (the celebration of the end of Ramazan) so I knew we’d have to make it a priority today (jetlag be damned!). Nisha, who is Muslim, had told us this would be a great place for us to go. She thought we would have a lot of fun. Our (Christian) driver was not so convinced. “I don’t think it’s that bad in the main areas,” I said, trying to be tactful. I knew plenty of people who had ventured out perfectly safely to eat and celebrate. I had a sense that while there may have been some grain of truth to parts of what he said, it struck me as probably one of the many stereotypes fellow Bombayiites had about other castes and neighborhoods that they probably knew very little about. Besides, there was nothing but excitement and food and salesmanship surrounding us. 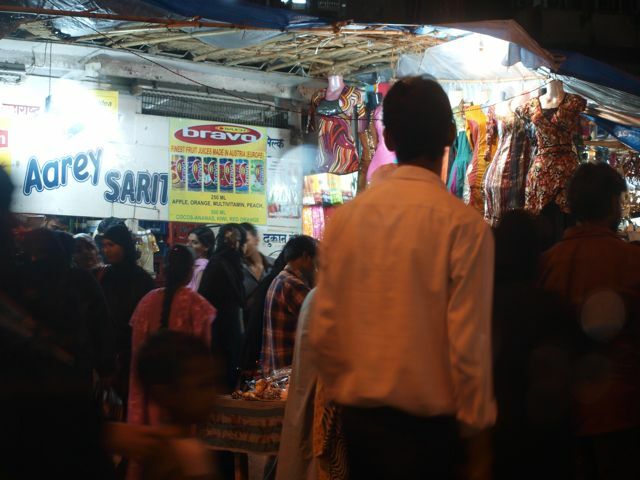 Everywhere you looked, food was cooking on indoor and outdoor stoves, men sold bangles and kufis, stilettos and hijabs. Sellers negotiated animatedly with potential buyers. The scene goes on and on like that for miles. You can stay on the main road or venture down side streets where the food can range from typical rice dishes to the more adventurous (brains and tongues and any other animal part you can name). And if you’re driving in, don’t be in a rush. It’s wall to wall traffic as everyone tries to push their way through the crowd. It’s hard to describe the feeling that was in the air but I guess as a Jewish person I could relate to it somewhat – after all day of fasting on Yom Kippur I’m usually giddy with excitement to eat. If I could multiply that by an entire month of fasting each day I can’t imagine how elated I would be every night just to eat and soak in the energy. It seemed sort of fitting that we were going to see Ramazan’s end right after Rosh Hashanah, the Jewish New year. For us and everyone around us tomorrow is a new beginning. It was a good welcome back. We marched out of the Dharavi hospital with a sense of purpose. I’d come back to begin my project here with the domestic violence prevention center. I’m going to be documenting the work they do and so I’m starting by shadowing for a few days. I’d met up with the supervisor in the main office, but he was taking me to the field office, in the heart of the slum. We had to go single file – there are no sidewalks in Dharavi that I’ve seen. We were walking along 60 Foot Road, which is named quite literally for the width of the street. It’s a bustling thoroughfare with shops on either side and then trucks, cars, motorbikes, people, stray animals, and trash all crowding the road. Because of the monsoon everything is wet and mud sticks onto my feet and legs within the first steps. At times I had to breathe through my mouth when passing a particularly garbage-filled (or excrement laden) area. I tried mostly to concentrate on putting one foot in front of the other and following my leader. I kept one eye on his black shirt in front of me and one eye on the ground so I didn’t fall or step on anything that could hinder me. We maneuvered through large good carrier vehicles parked on one side of the road while cars and motorbikes went around us on the other side. It’s like an elaborate game of Frogger getting through the Dharavi streets, and you can’t stop paying attention for more than a moment. But when I could steal away moments of attention, I tried to take in the energy of the place. It’s like it’s own small city in the middle of a metropolis. The commotion has a pattern and every shop and stand is bustling with the breath of the community. It’s colorful and chaotic and exciting – even while you’re trying not to get run over. By the time we got to the office my sandals were soaked through and the bottom of my blue kurta was splattered with mud and dust and who knows what else. The office is mostly just an empty room with no windows and no formal door – paint cracked on walls that were entirely empty except one team photo. Everyone sat on the floor, paying no attention to the one piece of furniture in the room, a desk with an unused old computer. But the circle of women that occupied the space filled the room with their vibrancy. I took my shoes off and sat with the women, who were diligently writing in notebooks on wooden trays perched on their laps. One volunteer, who had been brought along to translate for me, alerted the group to my presence. In Hindi she explained who I was and why I was there. Everyone looked up and smiled at me – without words I knew I was welcome. Through slow translations I began asking questions. The most vocal of the group, a woman of approximately 30 in a blue kurta with her hair pulled into a tight bun, started by explaining their day to day activities. In the morning they document the previous day’s work (hence the writing when I walked in) and do office activities. In the afternoon they hold sessions. The sessions consist of groups of women from the community who want to talk about any issue that’s bothering them, whether it be sanitation concerns, food rationing, or safety. The field workers try to use these sessions to solve community issues as well as raise the problems of domestic violence. Even though all of this was being said to me in Hindi, the woman speaking looked straight at me as she talked, as though she wanted to make sure the message was coming through. I asked why the subject of domestic violence had to be addressed in such a roundabout way. A quiet woman in an orange sari with a slew of bangles and earrings responded animatedly once my question was raised. She said it’s an impossible topic in Dharavi. No one would come to their group sessions if they were just speaking primarily about domestic violence. Most of the time, if a woman raises the issue, she begins by saying she has a cousin or a neighbor who is experiencing violence in the home. Then the workers have to approach her later to find out if it is really she who is in need of help or counseling. We talked for over an hour through translations about the various work they do beyond the group sessions – outreach campaigns and talks and films, youth groups and now even a men’s group. They have an upcoming campaign August 15th for Indian Independence day where they will try to recruit new members. They’re also now training more active members in how to deal with domestic violence throughout the community beyond the group sessions. The women truly lit up when I asked why each of them had decided to make a career out of community work. All the field workers are originally from Dharavi and all the ones I spoke to had originally gotten involved through the groups they now lead. Most of them originally didn’t even know you could have a job where your duties were just helping others. But as every one went around the circle and told their individual stories it was clear that each had been inspired by the small changes they could create and now all were devoting their life to it. We took a break for lunch before they went out into the community for their afternoon work. I sat, hesitant. I certainly didn’t want to get sick from eating street food in Dharavi. But even before the Hindi was translated I could see that they all wanted to share their food with me. They all now had questions for me and it was my time to share. As they pulled out their rotis and various vegetables they started quickly asking questions to my translator while motioning for me to eat. I didn’t want to be rude. I couldn’t be rude – they had answered every question I had and had welcomed me in without hesitation. And now they wanted to share with me. So I took a roti, said a little internal prayer hoping to not get sick, and ate. As I ate I answered all their questions – why was I here in India? What country did I come from? Did I like being in Mumbai? Did I miss home? Did I like Indian food? Through the translation they all laughed and smiled and kept asking more and more questions. And when lunch was over and they were off for their afternoon work I said goodbye and made my way back through the crazy streets of Dharavi. I’d be back the next day to see the group sessions and I already felt truly lucky to be able to watch them work in this place they loved so much. I am beginning to understand the root of “Indian Time” a little bit better. It’s not (as my Indian friends at home would have me believe) just an Indian way of life where they are allowed to be late to things because its inherent to Indians. I think in actuality it’s related to something much simpler. Indians are late to everything because, at least here in Mumbai, there are NO STREET ADDRESSES. This is really how it has to be done. Because you can’t just say “Oh when you get to the bakery go straight, turn right on St Dominic and then left on St Cyril because NONE of these roads would have a sign indicating that that is actually the name of the street. Not to mention that the main road, Turner Road, actually (if you look at a map) technically changes into Gurunanak Marg right before our house – but no one knows that. To them it’s still just Turner Road. Even after it THEN turns into Perry Rd. And you’d think you could solve this problem with a driver, but you can’t. Today I wanted to go a store to buy some Indian style clothes. The store is well known and its called FabIndia (I could delve into the awesomeness of that name, but I won’t now). And when you look it up online the address is: Navroze Building, Next To HDFC Bank, Pali Hill (Yes, that is the actual full address). So you’d think you could find it easily – but you would be wrong. When we went to Pali Hill (an area in Bandra), near the market there is an HDFC Bank but no FabIndia. We drove around, asked around, looked around. Nothing. We finally called FabIndia and solved the mystery. We were meant to know its next to the OTHER HDFC bank in Pali Hill. Up Zigzag road. Not by the market. Obviously. It’s hilarious, completely Indian and yet an all encompassing theory to explain the Indian loose relationship with time. It’s inherently frustrating but you can’t help but love a city where people find their way around SOLELY based on trusting everyone’s local knowledge. So if you want to come visit me, just remember: La Paloma doesn’t exist. Just go to the tree in the middle of the road in St Anthonys Rd next to the hospital, next to Lemongrass Restaurant, next to CitiBank, next to Crosswords bookshop. Then ask someone where to go. And don’t worry if you’re late- we’re all on ‘Indian Time’ here.